We now have one the most sought after pinball machines in our showroom - The Addams Family Pinball Machine. Based on the 1991 classic movie, the game features genuine speech from the actors Raul Julia and Anjelica Huston and excellent game play; you can see why it’s continually voted the best pinball machine ever made. The pinball machine was manufactured by Midway in 1992 under the Bally name with the help from American designer, Pat Lawlor (widely known as one of the best designers in the field.) When it was released, arcade games and pinball machines were in decline due to the arrival of home games consoles, but the Addams Family pinball machine spiked a big interest in the classic game once again. Since then, The Addams Family pinball machine has become the best selling pinball machine ever with over 20,270 units being sold worldwide. The objective of the game is to enter the strange world of the Addams Family, mainly to explore the mansion and progress to the vault multiball. There are 12 rooms to discover in the mansion plus a Revolving Bookcase, the family Graveyard and the Staircase Ramps. Some other aspects of the game include Thing who appears out of a box on the play field and uses a magnet to pick up the ball and disappear again. The ‘Power’ is a prominent feature of the game which causes the ball to change course completely through magnets under the playfield. Another great feature is The Thing Flips, which was the first CPU controlled flipper used in pinball. It works through the use of an optical sensor enabling the machine to read the speed of the ball so that it can take control of the flipper from the player to hit a shot on the opposite side of the field. We now have this classic pinball machine in stock in our revamped arcade and pinball showroom, so feel free to come and have a play on this great machine. 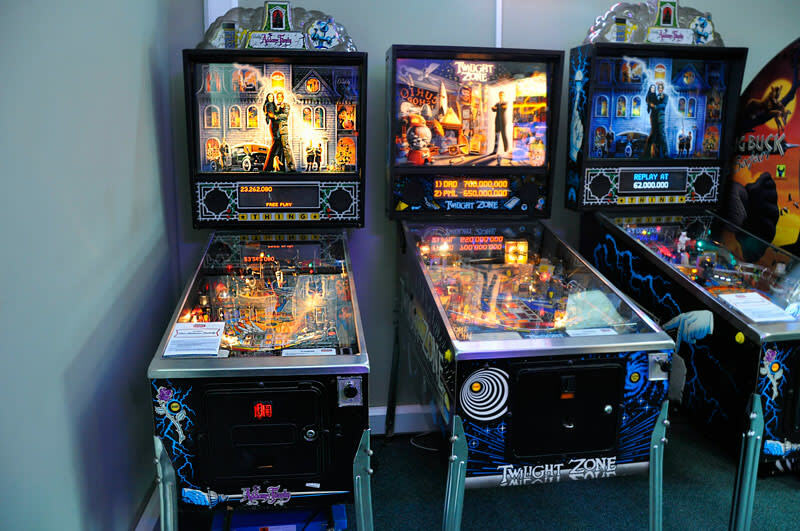 It’s been fully restored to a great condition by our pinball technician at Home Leisure Direct and has been through our 26 point check to ensure that it plays perfectly with no errors. We also have the upgraded version of The Addams Family pinball machine in stock, if you’re looking for something extra special, which has lots of modifications like the addition of Cousin Itt and Uncle Fester Models, Colour DMD and LED lighting on the playfield. If you would like to add the Addams Family pinball classic to your games room or home then you can call our sales team for free on 0800 622 6464 or e-mail them on sales@homeleisuredirect.com to speak to a member of our expert team who will be able to answer any questions or queries that you may have. The pinball machine comes with free delivery and installation (worth £200), which also includes a 30 day warranty on the product which covers parts and labour for any repairs that you may need.